Jems is four years old and weighs just over 7kg (16lb) - A staggering 15kg (36lbs) short of the average male of that age. 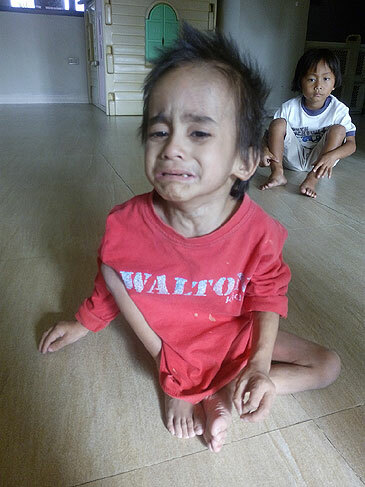 I am reluctant to post this photo, but hang in there with us and we will post some encouraging updates in the coming weeks as we work to help this little boy and his sister. Since arriving Jems has seen some fantastic improvements. He now weighs 8.4Kg and is smiling and giggling. However Jems is severely delayed when compared to the expected physical and mental developmental milestones.. He has had a traumatic upbringing that has obviously had severe repercussions and will need special one-on-one attention.